It's time for the last in Julie's mini-series. It's been so inspiring to follow this and see how different a simple change can alter the look and feel of a stitched piece. Whether it be by number of strands, the colour or which type of thread you use. If you've been following these mini-sampler tutorials, you’ll already have experimented with thread thickness and thread color. With this last thread mini-sampler, we’ll try out different thread types. We modern embroiders are spoilt for choice when it comes to the variety of threads available to us. 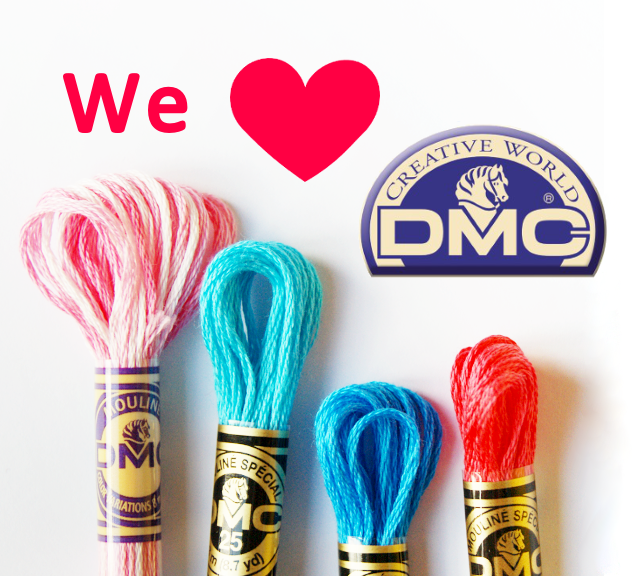 DMC alone makes a wide selection of thread types, but we can also use hand-dyed threads, silks, metallics, Japanese threads - and so many others. We often gravitate straight towards the stranded cottons - and for good reason, it’s such a versatile choice - but every thread has something unique to offer. This mini-sampler is the one that refers most back to those original samplers I wrote about at the beginning of this series: stitched examples that you can refer back to later. This is the perfect opportunity to try out threads you’ve been curious about, test threads for a new project, or just broaden your horizons by trying something you never knew existed! One piece of fabric, about 9” x 10” / 23 cm x 25 cm; I used a print from Darla by Tanya Whelan for FreeSpirit Fabrics. 1 skein each of six different thread types in shades that match your fabric; For this example, I used DMC Stranded Linen L162, DMC Perle #8 519, DMC Stranded Metallic E334, DMC Coton A Broder No. 16 799, DMC Broder Medicis Wool 8899, DMC Satin S820. Here’s my selection of threads; you can see how different some of them are from the stranded cottons more commonly used. I’ve also noted here how many strands I used for each block, where applicable. Several of these threads are single-stranded; for the others, I’ve used a number of strands that makes them of similar thickness to the rest. Remove your fabric pen markings and frame as you did the others and there you have it - a set of thread mini-samplers you can hang and use as inspiration when picking threads for your next project! If you make a mini-sampler, we’d love to see it in the &Stitches Flickr Pool. I’ve had a lovely time guest blogging here at &Stitches; I really hope you’ve enjoyed these little tutorials. Thanks so much to Nicole and Carina for being such lovely hosts!